Reminder that there is no competition and no On Track this weekend for the Labour Day long weekend. Enjoy your break and we’ll see you back on Friday March 15 at Handicap Night. Centre Championships start on Saturday with Program 3 Centre Championships for U8-U16 athletes. Medals are on offer. The rules for the Centre Championships are here. Please find here a table of Championship events, dates and in which program medals will be awarded for those events duplicated in two programs. Doncaster LAC AGM will be held on the last day of competition Saturday March 30. Please find descriptions of committee positions here. Track and Field Carnival is coming up for pre-registered athletes only at Knox Little Athletics Track on the 16th and 17th of Feb. Thanks to all the parent helpers at the Challenge. Click here for results. Doncaster Open Day registrations have now closed. Stand by for more information and event timings in the next few days. Looking forward to a great day culminating in a fantastic fireworks display. Please click here for the confirmed entrants list (alphabetical) for the Doncaster Open Day on Saturday 22nd December. Congratulations to all the teams who qualified through to State. Find the list of qualified teams here. 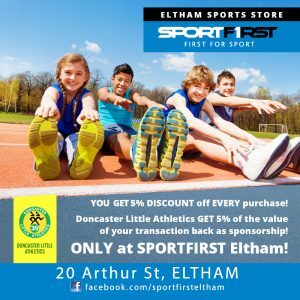 Buy your spikes, waffles and other equipment from SportFirst Eltham, mention you are from Doncaster Little Aths and receive a 5% discount on every purchase. The Centre will receive an additional 5% as sponsorship. They have spikes and waffles currently in stock. Relays provide an opportunity for athletes to participate in team events and to learn relay skills. Relays allow athletes form lasting friendships and develop a sense of teamwork, athletes enjoy competing in teams and cheering on club mates. Doncaster has a strong history in relays with many teams qualifying for the State Relay Championship. Further details to come soon. Come down to our Registration day on Saturday September 8, 10am – 12pm at The Pavilion Tom Kelly Athletics Track Rieschiecks Reserve George Street Doncaster. 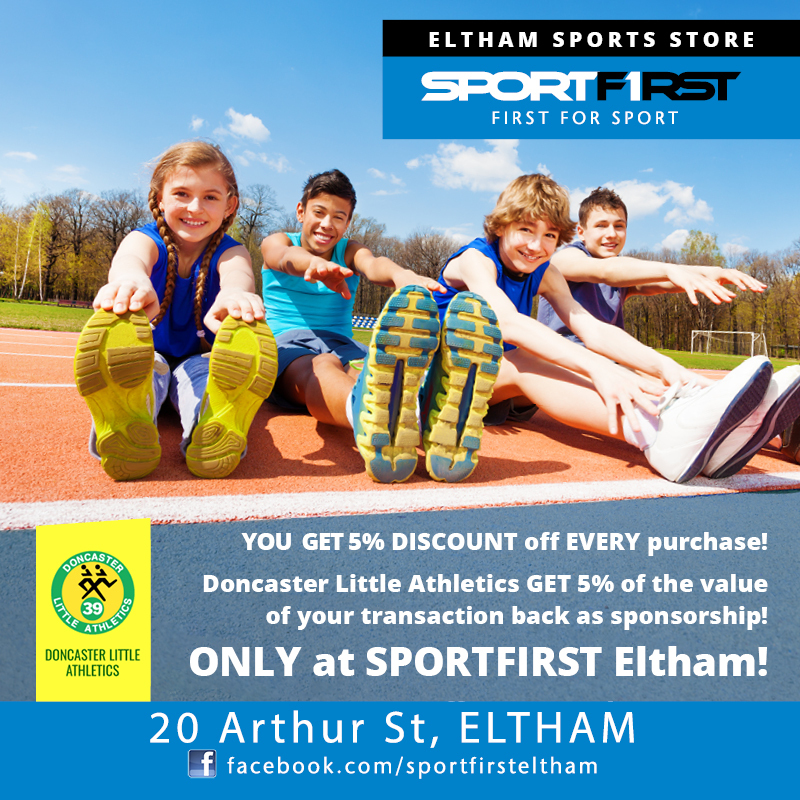 You will be able to meet representatives of the 4 clubs who participate at Doncaster Little Athletics and uniforms will be on sale. See more information here REGISTRATION DAY. For those new to Little Athletics, check out our HOW TO JOIN page for more information. Doncaster Open Day Saturday December 22, 1pm – 9.30pm with our annual Fireworks spectacular to conclude the evening. Just a reminder that the education courses for season 2018-2019 commence soon. These activities are designed around improving the education of DLAC and other center’s volunteers. Details on registration is on the sheets as well as the LAVic website under Education & Training, Coaching or Officials. Thanks again for your assistance to Little Athletics Victoria and Doncaster Little Athletics Centre. The first Little Aths Cross Country race is Saturday the 22nd of April at Box Hill… check out the Cross Country page for more details. Stay connected via Team App for Cross Country updates. Reminder that Little Aths is on at Doncaster on Wednesday, to avoid the Australia Day Long Weekend. 2017/2018 Season Kick Off Saturday 30th September. Only one more sleep until the Little Athletics season commences. Don’t forget the program starts at 8.30am for all age groups. We’d like to see everyone at the season start, but being the middle of the school holidays a long weekend, and Grand Final day to boot we understand that numbers may be down. If you athlete is participating tomorrow please come prepared to do duty. We plan to be finished before 11:30am so that everyone can get to their BBQ’s, couches or the ground for the lucky few. The summer Athletics season is nearly on us (season starts Sat 30th Sept at 8:30am for all athletes). This Sunday DAC & DLAC are having a working bee to make sure the track and equipment is all ready for the season. Working bee runs 9am – 11am , it would be good to see as many members there as possible. Doncaster Athletics Club (DAC) is the Senior Athletics Victoria (AV) Club that also trains and competes at Tom Kelly Athletic track, a number of our older athletes compete for both DLAC and DAC and even more make the move to DAC once their Little Athletics career is over. Check them out for more info on the club and upcoming events at their Facebook Page . Bill Chambers Handicap is being held this Sunday 20 August at Ruffey Park Lake, Boulevard entrance commencing at 9am. There will be a 3km and 6km event. Please arrive at 8.30 if competing to arrange the Handicaps. This is an annual event with a trophy awarded at the Doncaster Athletics Club’s Annual Presentation Night. DAC Trivia night, Saturday 2nd September 6.30pm-11.00pm in the Pavilion. Just a reminder that the education courses for season 2017-2018 commence soon. These activities are designed around improving the education of DLAC and other center’s volunteers. Regional Cross Country is at Ruffey Lake Park in Doncaster. While under 6, 7 & 8 can’t register for Regionals, there will be “fun run” races on the day for those age groups starting at 9:30pm. Registration for Regionals also covers registration for States. The only qualification that you need to run at States is that you registered & competed at Regionals. Box Hill Open Day – Doncaster LAC can’t bulk register athletes for this event as in previous years, so athletes will need to register individually and pay the fee (info below). Yes this is a change on what we communicated previously – apologies. Box Hill Cross Country on Sunday 18th June (Queen’s Birthday Weekend). Division One Cross Country Open Day is being held on Saturday 10th June (Queen’s Birthday Weekend). The Essendon Cross Country Open Day is being held on Saturday 15th July. Regional Cross Country is at Ruffey Lake Park in Doncaster. You need to register for Regionals on the link above. Please review the attached sheet for your duty. We have filled most duties, but could do with a couple more people to help set up from 7:30am onwards. We also need a parent to relieve Steven on checkpoint A after the first two races. Let us know by email if you can assist with either of these. If you are unable to fill your role on Sunday, please talk to other parents to arrange a swap. All the Cross Country organisers also have other duties to fill on Sunday morning as well. Remember we have already enjoyed four Cross Country events put on by other clubs, it’s now our turn to host a well run event, and that requires parent assistance. Races start at 9:30am with the 3km course, and then follows the Eastern 7 timetable as normal. The course map is linked below. Please note that the best access to the Start/Finish area is towards the end of McCallum Rd. There is usually parking available along this road. We will have a coffee van on site, and the venue is a dog friendly one. Hi, we’re back into the thick of Cross Country this weekend with races on both Sat and Sun. We are also hosting the race weekend after this one, so read below on how you can support this. This is outside our Eastern 7 competition, but is a fun day with individual and team medals on offer. Registrations closed yesterday, but if you are still keen to run you can register on the day if you turn up before 9:30am and pay the $10 (cash only) registration. Races start at 10am, the order of events is on this page Knox Open Day. Please check it as the order/timing is different than Eastern 7 events. The following Sunday we are hosting the Eastern 7 cross country at Ruffey Lake Park. We are required to fill ALL duty roles for this day. If your child runs cross country, please expect that you will be doing duty on this day. This may mean being at cross country for longer than just your childs race. We will have a sign up sheet for duty available this Sunday, please come and see Kath or Kim and sign up for a duty. Any duties not filled by the end of this Sunday we will be nominating parents for. We need to fill approx 25 roles on the day and all hands on deck for pack up. Duty roles include, course set up, start and finish marshalling, course marshalls, time keepers, announcer, starter etc. We also need to fill “Hare and Tortoise” roles, we already have a few senior athletes and older age little athletes, but any fit, fast parents come see us if you want to help out here. We will also have a few duty roles at Regionals and Eastern 7 Rewards, but this event relies totally on Doncaster Parent volunteers to run. Your athletes have already enjoyed a number of cross country races where we didn’t need to do duty, so now it’s our turn to repay that. Below are some upcoming days that require nomination/and or registration, have a look at each of them and register. You have to register for and compete at Regionals to run at State Cross Country. It doesn’t matter what you come at regionals, just competing qualifies you for state. Your registration fee for Regionals covers you for State Cross Country as well. There are medals given at regionals for both individuals and teams. Cross Country teams at Regionals & State are 3 runners from the same club. Athletes are awarded point based on the position they finish in. The teams aren’t defined before the race, they are just the first 3, next 3 etc runners from each club. It would be great to get at least 3 participants in each age group at these events and in completion for a team medal. This week’s race is hosted by Camberwell/Malvern at Orchard Grove Reserve in Blackburn South (see map here). This is a good venue for being able to see a bit of the races as some of it is run around the outside of an oval. Timing of events is 9:30am U13-U15 3k, 9:45am U11-U12 2k, 10:00am U6 500m, 10:15am U9-U10 1500m, 10:30amU7-U8 1k. Don’t forget to wear your subway bib. We are running low on stock of small sized uniforms. We are currently seeing what we can do about getting more at this point in the season. Alternatively if anyone has any 2nd hand ones they would like to pass on, please bring them along. This is outside the Eastern & Cross Country program, so you need to register separately for the day. It’s usually a well attended day & has medals for individuals and teams, similar to the regional format. 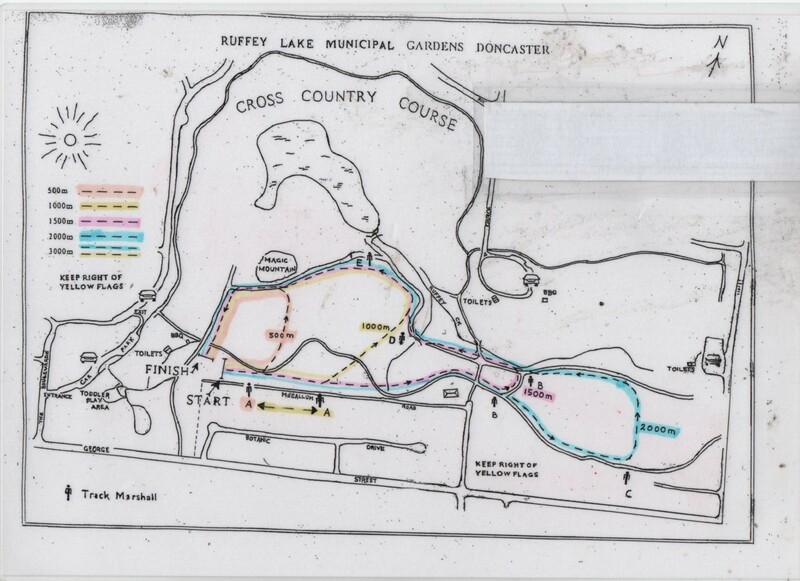 Regional Cross Country is coming up on Sat 24th of June at Ruffey Lake Park in Doncaster. You need to register for Regionals on the link above. This is a fun team event for U9 – U15 run at the Sandown racecourse. We need to enter age group teams of 3, unlike regionals and state we need to nominate the teams in advance, we can have more than one team in each event if there are enough runners. The team run their standard Little Aths cross country distances each as a relay (no baton carrying required). This year it is being held on Sat 8th of July which is the middle weekend of the school holidays. Can you let us know if you would like your child to run at this event and we will start to pull teams together. We had a good turn out last weekend for the start of the Cross Country season, on a lovely sunny Sunday morning. Hope to see more of you out there next week. This week’s race is hosted by Kew at Stradbroke Park in Kew (see attached map). To ensure a smooth running of the events and the season, could you please ensure your child is registered for Cross Country & that they WEAR THEIR BIB on race day. Subway Bib – please make sure you have your bib each weekend. The runners will be scanned to record their times. If athletes do not have their bibs on, it slows down the running of events, some centres will refuse to record times if athletes aren’t wearing their bibs. If you have lost yours from the summer season please let us know ASAP. The Cross Country Season is FREE to participate in for all summer registered athletes. If you do want to run this winter, we ask that you complete the Cross Country registration form. This will allow us to get emails out each week to those that are intending to run Cross Country. After this week, Cross Country information will only be sent out to those who have registered for the season. When registering, don’t forget to press submit TWICE to register successfully. The first Cross Country of the 2017 season is being held by Box Hill at Gardiner’s Creek on Sunday 23rd of April. 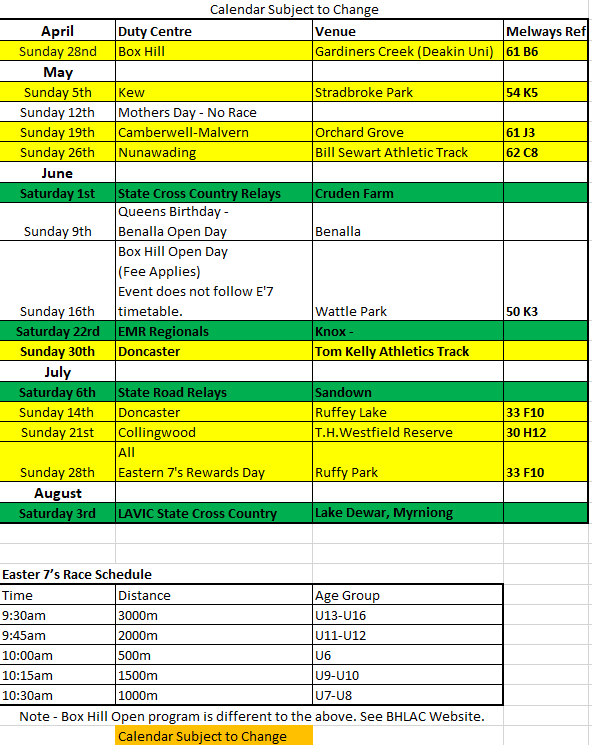 The flyer with map and details for this weekend’s races is here Box Hill CXR . Don’t forget to complete your (free if you ran summer Little Athletics) Cross Country Registration. If you are new to little athletics, or require any further information, check out our Cross Country Page . The Cross Country season runs over winter, from April 23 2017 – July 30 2017. We ask that all existing Doncaster Little Athletics athlete, register their interest here Cross Country Registration. While the cost of running Cross Country is included in your summer fee, registering here allows us to communicate with those planning to participate over Winter. Athletes need to run in the Doncaster Uniform over the Cross Country Season. Training sessions are Mondays and Wednesdays during the season from 4.30pm-5.30pm, meeting at 4.30pm sharp at Rieschieks reserve. Visit our Cross Country Page for further information, including for new Little Athletics registrations. There has been some recent changes in our schedule due to alterations with LAVic events and other competitions. These changes are now updated in the calendar on the website or in Team App under schedule. Please do not refer to your printed calendar for the next few weeks due to these changes. An updated PDF file for easy printing is available, just click here. All financial DLAC members of all age groups are invited to participate, so please check that your child is listed here. If you cannot see your child’s name, please email Marilyn on results@doncasterlac.org.au so she can update the list before Friday so that your childs events are recorded successfully. Thanks to everyone who participated in the Doncaster LAC Open Day. The medal tally results are available here, and the results by event are available here. Results for previous years can be found here. The Cross Country season runs over winter, from April 28 2019 the cost of running Cross Country is included in your summer fee, we do not require additional registering for Cross Country for this season. Doncaster LAC competes against athletes within the Eastern 7 group, which includes Box Hill, Camberwell/Malvern, Nunawading, Ringwood, Kew and Collingwood. Races are held on Sunday mornings, at various locations around the Eastern suburbs, from 9.30am and we’re usually finished around 11am. Please come to the Doncaster LAC table each week so we can record your child’s attendance. In the Winter we put our Doncaster clubs rivalry aside and run under the Doncaster Centre banner. Athletes must compete in the Doncaster Uniform (NOT THEIR CLUB UNIFORM). Uniforms will be available at the venues from 9am for the first few weeks of the cross-country season, after that by arrangement with the cross country co-ordinators. Cross-country registration is included as part of your Track & Field Registration. For those athletes not registered for the 2018-19 Track & Field Season, cross-country must complete a New member’s registration (reduced to $95 for remainder of season). Click here to calculate your athlete’s age group. Bring Proof of Age e.g. birth certificate, passport etc. so your registration can be completed. Please allow time to have this completed before your event starts. If you do not register before midday on the Friday before your first event you will run as a “trial” at that first event and then be fully registered the following week. Please contact the Centre Registrar for more information on registration. Note that Training will go ahead in almost ALL WEATHER unless there is lightning or flooding – the sunny Autumn days won’t last forever! At Little Athletics, our emphasis is on Family, Fun & Fitness. Children can join with any level of skill or fitness. Children are given plenty of encouragement to achieve personal bests (PB’s), giving each and every child the opportunity to continue to improve and earn bronze, silver and gold medals throughout the season. If you are uncertain whether your little person will like Little Aths, you are welcome to two free trial sessions on any competition day (excluding special registration events – see the Calendar). We do recommend to register online first, just don’t pay until you’ve completed your free try-outs. Contact one of the club registrar of how best to organise this. Other than trials, you cannot compete until you are registered and financial. Little Athletics is open to any boy or girl five or older (check the Age-Group Ready-Reckoner. Your child must be five or older before they can participate. There are 4 clubs at the Doncaster Centre and schools in the area are allocated to these clubs. We do encourage families towards the clubs associated with their school, however you are free to choose any club because of family or friends etc. Find your school in the table below, or get in touch with the centre to work out which club will be best for you. Registration will be open from early September, 2018 through the LAVic website, as described below. After registering on the LAV website, print off your Proof-of-Payment page & Parent’s Charter and bring them along to Registration Day to complete your registration, arrange uniforms and collect your showbag with membership materials. All new registrations must produce a “Proof of age” such as a birth certificate, passport etc. Registration Day is 8th September 2018. See the Registration Flyer for more details. You will have recently received an email with your child’s username and password from Little Athletics Victoria (if you have not received this email contact your club registrar). Go to the LAV website and click on register for 2018/2019 “Register Now” button. Click on Renew your members and login with the username and password to complete your registration. Follow the prompts and pay online as per previous seasons to LAVic. Your child will receive their bib once they are financial and active. No need to come to registration day, unless you want to buy uniforms or have any questions. If you are considering the free trials, just submit the registration without paying (you can pay the fee after your free try outs are completed). Come to Registration Day or your club desk with your Proof-of-Payment and some Proof-of-Age for your child. It is a condition of registration that parents perform their rostered duty. Please read the Parent’s Charter before registering your child (part of registering online is by accepting and agreeing to the charter). DLAC has no paid staff – everything depends upon the efforts of volunteers to prepare and run the events and pack-up afterwards. A competition day at Little Athletics isn’t only about the kids. All the events our children take part in are run by parents whose children are also participating. The kids enjoy it and their parents get to have fun, too. The Duty roster gives parents a chance to have fun being involved with the athletes, cheering them on and guiding them. Kids get a kick from having their parents officially measuring their throw, run or jump and most people find it’s more fun to occasionally have a hand in their children’s events than just watching. So there is a Duty Roster. It’s not optional! If you have difficulty being available for duty please don’t hesitate to speak to your Club’s Parent-Organiser or President. As we’re all volunteers we understand that everyone has constraints to work around. Each Club rosters parents to help run the On-Track and Competition events that they are responsible for. The details of the roster depend upon each Club and the event. The tasks don’t require any prior Athletics experience – this handbook describes each event & how you can help (it also gives hints about becoming a qualified official, but that’s entirely up to you). If someone else will be bringing your child on a day you’re rostered for duty (and you haven’t made other arrangements with your club’s organiser) that’s ok – we’re happy for that person to fill-in in your stead. Note: for insurance reasons, the person performing the duty must be either a parent/guardian on the athlete’s registration, or must provide their name on-the-day for our Centre records. Athletes are also required to wear a club uniform. (approx $40 – $70). The registration fee does not include uniform costs. The registration fee includes the Doncaster coaching program and Special Event days at Doncaster (Open-Day, Multi-event, Handicap Day, Centre-Championships & Doncaster Cross-Country) as well as Region Relay competition. Region and State Track&Field, State Multi-Event and State Cross-Country now require separate online registration and payment, they are not included in the Doncaster registration fee. These are optional events and require separate registration and payment as they occur. External programs such as Junior Development Squad (JDS) and the Crystal Creek Camp are also not included. If you are having difficulty paying these fees, please don’t hesitate to speak to your Club President regarding payment options. Little Athletics Victoria expects all members to comply with the Code of Conduct. Appropriate action may be taken in the case of any breaches of the Code of Conduct. Little Athletics Victoria will ensure that all athletes, coaches, spectators, parents, officials and administrators are not prone to sexual abuse, neglect, physical abuse or emotional abuse. They will ensure that all persons are included, protected and not discriminated against in any manner. The LA Vic Code of Conduct is available here. Please read the Officiating Booklet. Our photo galleries allow us to recognise the effort, determination & fun our Athletes put into their events. Anyone who wishes to take photos at the Doncaster Centre will need to read and abide by this policy. DLAC does not want to stop parents/carers from taking legitimate images of their own children for personal use, however there are restrictions. This policy has been introduced to protect Doncaster’s most valuable assets – our young athletes.